TOSLINK (from Toshiba Link) is a standardized optical fiber connection system. 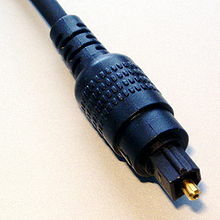 Also known generically as an "optical audio cable" or just "optical cable", its most common use is in consumer audio equipment (via a "digital optical" socket), where it carries a digital audio stream from components such as CD and DVD players, DAT recorders, computers, and modern video game consoles, to an AV receiver that can decode two channels of uncompressed lossless PCM audio or compressed 5.1/7.1 surround sound such as Dolby Digital Plus or DTS-HD High Resolution Audio. Unlike HDMI, TOSLINK does not have the capacity to carry the lossless versions of Dolby TrueHD and DTS-HD Master Audio. Although TOSLINK supports several different media formats and physical standards, digital audio connections using the rectangular EIAJ/JEITA RC-5720 (also CP-1201 and JIS C5974-1993 F05) connector are by far the most common. The optical signal is a red light with a peak wavelength of 650 nm. Depending on the type of replica jaeger-lecoultre simple watches modulated signal being carried, other optical wavelengths may be present. A less common format is a coaxial cable ending in RCA jacks, which is found on some receivers. Toshiba originally created TOSLINK to connect their CD players to the receivers they manufactured, for PCMaudio streams. The software layer was based on the broadcast audio standard AES3 and was adapted as the "Sony Philips Digital Interconnect Format" (S/PDIF) which varies from AES3 only in voltage level. TOSLINK was soon adopted by manufacturers of most CD players. Early TOSLINK systems used the raw PCM data from the CD player; the S/PDIF standard has now become nearly universal for audio streams. It can often be found on DVD players and some game consoles to connect the digital audio stream to Dolby Digital/DTS decoders. The name is a registered trademark of Toshiba, created from TOShiba-LINK. Variations of the name, such asTOSlink, TosLink, and Tos-link, are also seen, while the official generic name for the standard is EIAJ optical. Other terms are sometimes used for technology similar to TOSLINK, such as ADAT Lightpipe or simply ADAT Optical. These are most often seen in the professional music/audio industry. While the ADAT Lightpipe format uses the same JIS F05 connectors as TOSLINK, the ADAT Lightpipe data format is not compatible with S/PDIF. Due to the use of clock recovery, TOSLINK cables are widely rumored to introduce jitter (reproduction inaccuracies due to timing errors), erroneously described as "smearing" or a poorly articulated sound. However, the actual effect of iwc yacht club replica watches jitter on audio reproduction is an increase innoise or intermodulation, and most humans' hearing is not likely to notice any effect. Multi-strand glass fiber TOSLINK cables might cause less jitter than larger diameter, single strand cables. One cause of jitter is bandwidth-limiting of the digital signal. Due to their high attenuation of light, the effective range of optical cables is limited to 5–10 m. They can temporarily fail or be permanently damaged if tightly bent. Optical cables are not susceptible to electrical problems such as ground loops and RF interference. Bandwidth can be 10 MHz with high-purity quartz fiber, but 5–6 MHz for plastic optical fiber. Several types of fiber can be used for TOSLINK: inexpensive 1 mm plastic optical fiber, higher-quality multistrand plastic optical fibers, or quartz replica rolex bronze watches glass optical fibers, depending on the desired bandwidth and application. TOSLINK cables are usually limited to 5 meters in length, with a technical maximum of10 meters, for reliable transmission without the use of a signal booster or a repeater. However, it is very common for interfaces on newer consumer electronics (satellite receivers and PCs with optical outputs) to easily run over 30 meters on even low-cost (0.82 USD/m 2009) TOSLINK cables. TOSLINK transmitters operate at a nominal optical wavelength of 650 nm (~461.2 THz). Mini-TOSLINK is a standardized optical fiber connector smaller than the standard square TOSLINK connector commonly used in larger consumer audio equipment. The plug is almost the same size and shape as the ubiquitous 3.5 mm stereo minijack. 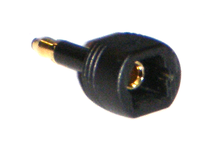 Adapters are available to connect a full-size TOSLINK plug to a mini-TOSLINK socket. There are combined 3.5 mm jack and mini-TOSLINK sockets which can accept a 3.5 mm jack or a mini-TOSLINK plug; mini-TOSLINK plugs are made 0.5 mm longer than electrical jack plugs so that the latter are too short to touch and damage the LED of combined connectors. Many notebook computers use these connectors, e.g., for either 3.5 mm electrical headphone output or TOSLINK digital output, and for either electrical microphone and TOSLINK line-in. Mini-TOSLINK jacks are commonly used on laptop computers and portable digital audio equipment.